A British wildflower with yellow and orange tinged flowers all summer from May to August. These are nitrogen-fixing plants and can be seen growing in grasslands on average to nutrient-poor soils. Pollinators love these plants. 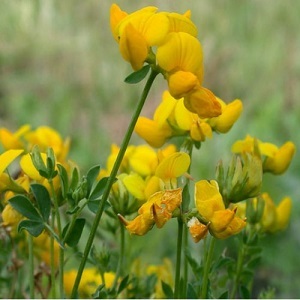 Bird’s Foot Trefoil grows best in meadows and flowery lawns, tolerating some cutting and grazing. The plants make good ground cover. Pack of approx 300 seeds. Sow in spring or autumn. Sowing instructions and a colour photo are printed on the packet. Sow in spring or autumn. Germination can be optimised by soaking the seeds in hand-hot water overnight or gently scarifying by rubbing the seeds between two pieces of sandpaper before sowing. Sow the seeds directly into cultivated soil, raking over the soil and keeping moist until germination. Or sow the seeds into a seed tray, keep outside, and seeds germinate in 2-3 weeks. Help young plants to establish by keeping down too much competition from grasses and larger thuggish plants. Plants self-seed in the right conditions if the seed heads are left on the plants.